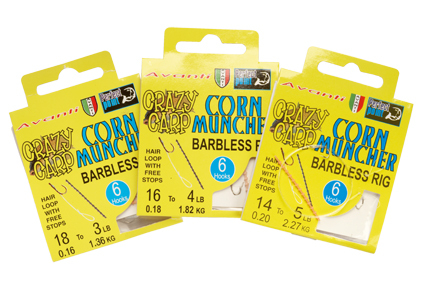 This range encompasses size 12 (meat) to 0.20 mm line, size 14 (mini boilie) to 0.18 mm, size 16 (pellet) to 0.16 mm and size 18 (corn) to 0.14 mm mono. These rigs are 16 in. 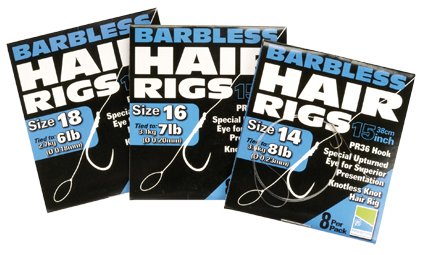 long and feature the popular Series 2 Barbless eyed hook pattern, tied to Micro Plus Line. 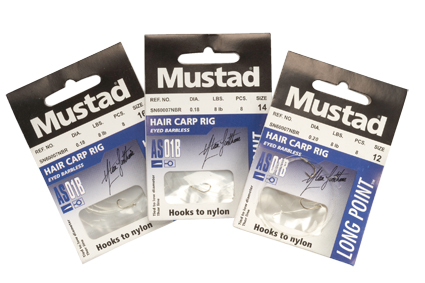 The hook is a wide gape, medium shank, black nickel pattern – with a beaked-in long point. You get eight rigs. My only gripe was the erratic length of hairs. On the corn rig they were too short. 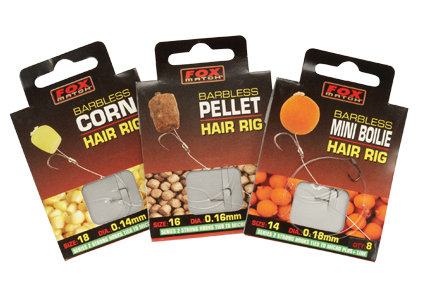 Range comprises size 10 hooks to 0.21 mm line, size 12 to 0.19 mm, size 14 to 0.17 mm and size 16 to 0.15 mm. The barbless hooks are a medium wire, spade end pattern, with round bends, beaked points, medium shanks and a bronze finish. Breaking strains were sensibly matched to each hook size and around 15 in. long. All knots were well formed and neatly trimmed, while the hairs offer neat bait stop anchoring loops. Only five rigs in a pack. 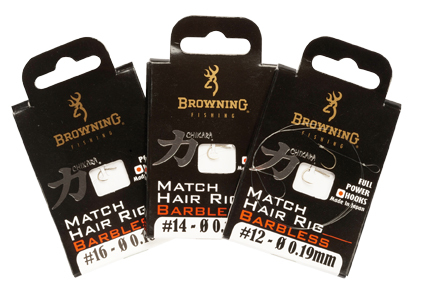 Barbless eyed hooks with a bronze finish, offering size 10 and 12 to 0.20 mm line, also size 14 and 16 to 0.18 mm mono. The strong, medium wire gauge hooks feature a slightly rounded crystal bend shape, ending with long beaked-in points. Their 18 in. traces are a tad long, although the knotless knots, long hairs and attachment loops were all perfectly formed. Eight rigs in a pack. Packaging gives 8 lb BS for both diameters, which can’t be right! Nice range of rigs includes size 10 hooks to 0.24 mm line, size 12 to 0.22 mm, size 14 to 0.20 mm, size 16 to 0.18 mm and size 18 to 0.16 mm mono. 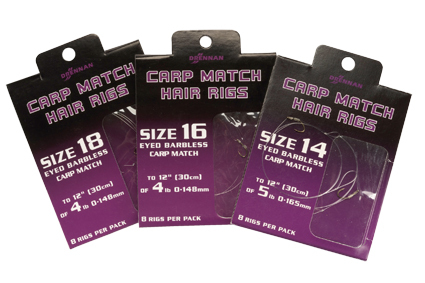 You get six rigs in a pack, along with ample free hair stops. The barbless hook pattern used is a nickel spade end, made from medium wire, with a wide gape and a marginally leaning in long point. These hook lengths were on the long side, averaging 22 in. The hairs were also long and some had overlarge bait stop loops. Built around the eyed PR36 pattern, which is a barbless bronze hook, with an upturned eye, a wide gape crystal bend shape and a curved-in point. These 15 in. rigs are available in size 10 to 0.25 mm mono, size 12 to 0.23 mm, size 14 to 0.23 mm, size 16 to 0.20 mm and size 18 to 0.18 mm. Packs contains eight pieces, protected in a plastic envelope. The knotless knots and hairs were perfectly formed, but the main attachment loops were a bit large. Comprehensive range includes 8 to 0.205 mm mono, 10 and 12 to 0.185 mm, 14 to 0.165 mm, and 16 or 18 to 0.148 mm line. The barbless eyed hook pattern has a medium wire gauge, medium shank, wide gape crystal bend shape and long in-turned point. This bronze hook is expertly tied with a knotless knot and correct length hair that’s supported with silicone tubing. The main line attachment loop is also small and neat on these 12 in. rigs. Eight in a pack.